Richie Whitt's DFW Sportatorium: American Sniper: Hero? Coward? Or Somewhere Between? 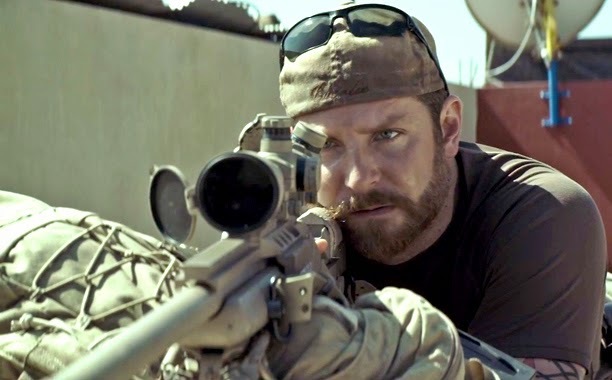 American Sniper: Hero? Coward? Or Somewhere Between? Saw American Sniper last night and, yep, figured my review was worth dusting off the ol' website. In short: It's a good - but not great - movie, about neither a hero nor a coward. I won't sit here and pretend I was close friends with Chris Kyle. At most, we were friendly acquaintances. I was flattered that he was a loyal listener to my former radio show on 105.3 The Fan. He even came on as a guest one day in 2012 at the old Duke's Roadhouse in Addison, and wound up staying after the show and hanging out late into the night as a judge for our Miss RAGE beauty pageant. He was always polite and respectful - and hopefully vice-versa - but no doubt we had our differences on military conflict. I would ask him why America needed to keep being the bully on the world's block, and he'd counter that it was simply his duty to keep bad guys from doing bad things, regardless of the location. We got along. I'd make him mad, and make him laugh. But in a way that, post-chuckle, he'd punctuate his reaction with "You're a jackass." Guilty. Kyle was more brave than I'll ever be. But no, even in Clint Eastwood's Hollywood-ized version of his life - Kyle isn't a hero. But he's also far from a coward, which to me is a preposterous notion. My opinion of Kyle lies comfortably between what Michael Moore thinks about him and where my former radio partner placed him - on a pedestal just above Superman and a smidge below Jesus. I'll go with what Kyle told me when he heard people refer to him as a "hero." He was just a guy with a gift, that used it to the best of his ability to help protect his country. An epic marksmen? No doubt. A badass? Every SEAL is. But a hero? Nope. To me a real hero is the guy who - guaranteed zero reward despite assuming monumental risk - voluntarily runs into a burning building to save a complete stranger. Kyle willingly chose the military for his career, and was compensated for it. He was doing his job. A dangerous, important job. But a job nonetheless. And boy did he ever do it well. With 160 confirmed kills, he is indeed the deadliest sniper in U.S. history. The movie, however, takes liberties and sometimes strays from Kyle's book by the same name, in an obvious attempt to inflate his legend. From Bradley Cooper's beard and build to the big, black pickup, the portrayal of Kyle is as uncanny as it is eerie. But where was the back-story building of Kyle via his celebrated bar fight with Jesse Ventura, his killing of two carjackers or his sniping of New Orleans looters in the wake of Hurricane Katrina? According to the book - and in opposition of the movie - Kyle wasn't suddenly impulsed to join the Navy after watching 9/11, his wedding wasn't interrupted by a call to duty, he didn't find weapons under the floor of an Iraqi house and there was no bounty placed on his head. I left the theater confounded how the movie made Kyle's SEAL training seem like a weekend at the beach. I was confused at how he overcame his own Post-Traumatic Stress Disorder seemingly overnight and immediately began helping soldiers cope with theirs. And I didn't get enough of Kyle's human side. For example, on the radio show he admitted he had a great fear of heights. Who'da thunkit? I remember when we got the news of Kyle's death. The Fan staff had just arrived back in Dallas from the Super Bowl two years ago and were at our Fan Bowl event at the House of Blues. News swept through the party like a suffocating blanket of sadness. That night I cried. But after watching American Sniper, I didn't. In life and at war, Chris Kyle was better than his movie.